First off I am having an issue where it seems to over extrude at the top of what i am printing leaving globs of material that require extra clean up that I don't want to deal with. 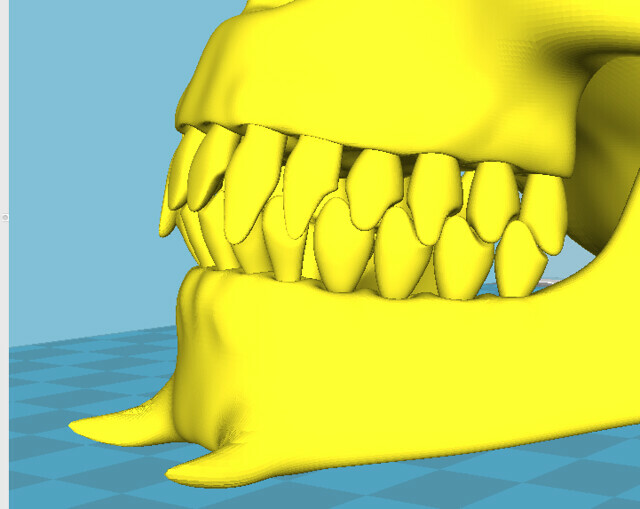 Next question is, how I can print these teeth properly as they overhang and Cura does not add support under them. It's not over extruding. The plastic on the horns is never cooling down to freeze point so it's staying liquid. You can do the "cool head lift" feature but it will come out much better if you simply print a small tower nearby for the printer to go over there and print positioned such that the fan blows on one of the horns at the same time. The teeth are much harder. I would do my own support in cad. 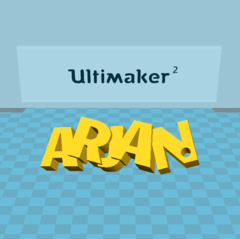 Is there a cad program that will import .stl files and able to edit them? Many programs will accept stl and allow to add supports. Spaceclaim also let's you convert the stl to a solid you can work with.... with various results.. but very usable. Thanks for this information, as this looks like an awesome program that I wish I knew about a week ago. Using this now to put in the supports. I don't think meshmixer will do the teeth - too close to other stuff. Any cad program will import stl - For example sketchup. Or Design Spark Mechanical. Meshmixer worked well for the teeth except for one. 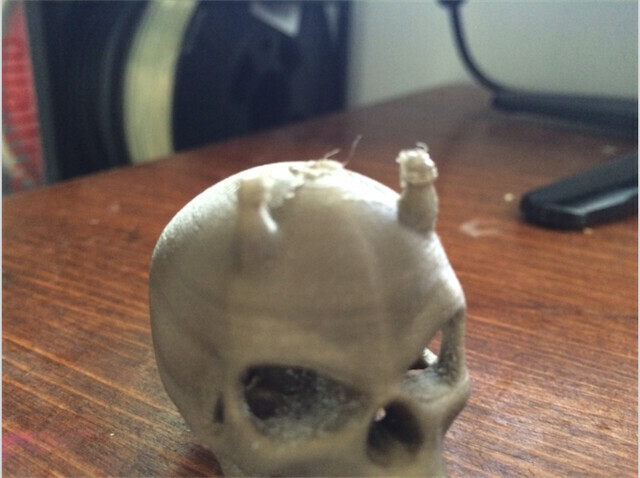 I printed the skull at 4.5" tall so it was enlarged enough that allowed the supports to be placed along the jaw and they were easily popped off. Thanks for all your great advise.